A cross-country fundraising adventure for a group of Taberites in mid-summer 2017, the Sea to Sea Bicycling Mission was an overwhelming success in raising funds to fight global poverty. Sea to Sea is a bicycling mission fighting poverty through fundraising and awareness, and supports Partners Worldwide and World Renew in their efforts to fight poverty around the world. In addition to Kempe, other local riders involved included Elly Torsius, Ruth Kielstra, and Brian Kuyper. Kempe had been training in preparation for the coast-to-coast fundraising ride, which left the Vancouver area on June 26 and made an overnight stop in Taber on July 11 at Taber Christian School. 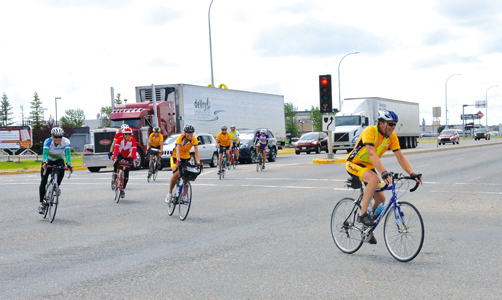 Some 70 cyclists were involved in the ride, along with 15 volunteers, and stops were made for riders roughly three to four times per day, about 25-30 km apart. When the bicycling mission reached its final destination, for Kempe that’s when the enormity of the accomplishment finally began to set in. Partners Worldwide is a global Christian network that uses business as the way to end poverty, partnering with local businesses and businesspeople around the world to use four methods — mentoring, training, access to capital, and advocacy — with the mission of ending poverty. Grueling mountain stretches through B.C. were conquered early on during the mission, with Kempe thankful that this was the first leg of the journey, and not the last. While mountain passes present an arduous challenge during the ascent, there’s sometimes a wind-whistling payoff going back down, as Kempe learned leaving the summit of Roger’s Pass. Heat and horse flies plagued the contingent through the Prairie region and on into the U.S. stretch of their tour, so chosen to avoid heavy shipping routes in Ontario that could have presented a safety risk to riders. Kempe was especially enthralled with the province of Quebec and its people, with the group crossing into the province east of Ottawa, traveling around Montreal, through Quebec City, Trois-Rivieres, past Rimouski, and then onward into New Brunswick. Sea to Sea tours have raised more than $5.5 million to support over 100 organizations focused on ending poverty both locally and globally. Today, Sea to Sea, hosted by World Renew and Partners Worldwide, continues to partner with churches and non-profits focused on freeing people from the cycle of poverty. Completing the tour itself was one thing, but doing it at the height of Canada’s sesquicentennial celebrations in 2017 was something else entirely for Kempe.